Last weekend Mel and I decided to take a break from unpacking to attend the Alameda Point Antiques Faire. There have been very few times where we had such a successful haul as this faire. While cruising all the vendors we came across an amazing rhinoceros wall mount. Don’t worry all you animal rights activists, this thing is made out of fiberglass! 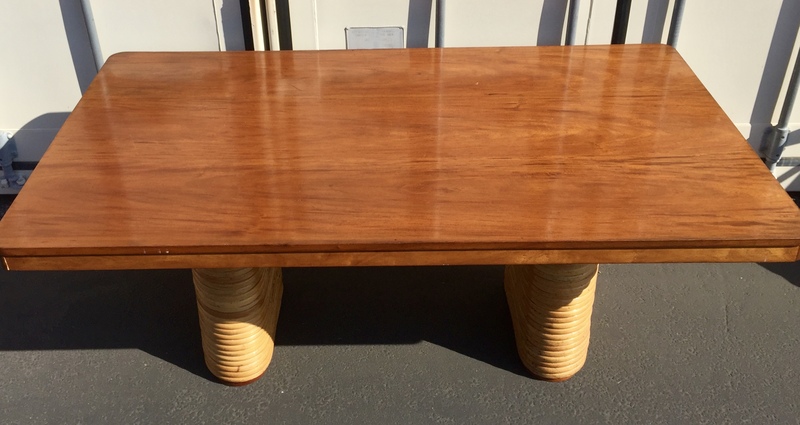 We purchased this from Bob & Bonnie of Alchemy Estate liquidations in spot M23. They were so nice and just wanted to make sure it went to a good home. 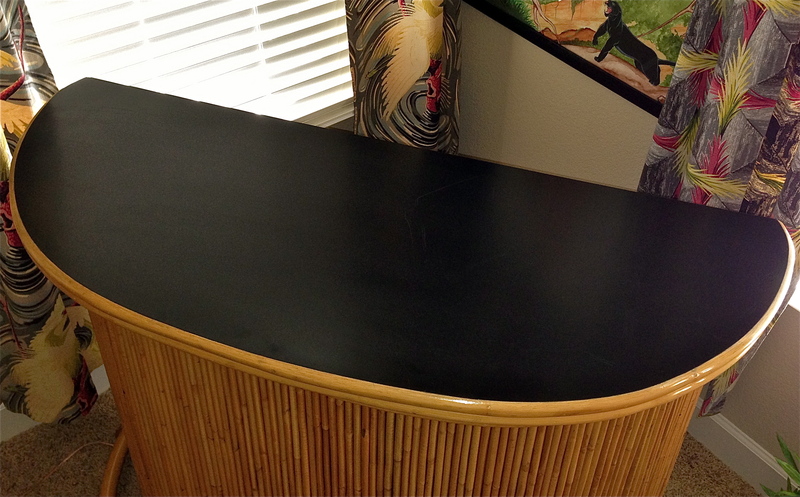 Our tiki room is quickly becoming a fiberglass game room! We were so excited to get this. We missed out on a hippo a while back, so this makes up for it. We are on the hunt for more of these fiberglass wall mounts and hope to add more to the collection. We will share our other scores shortly. 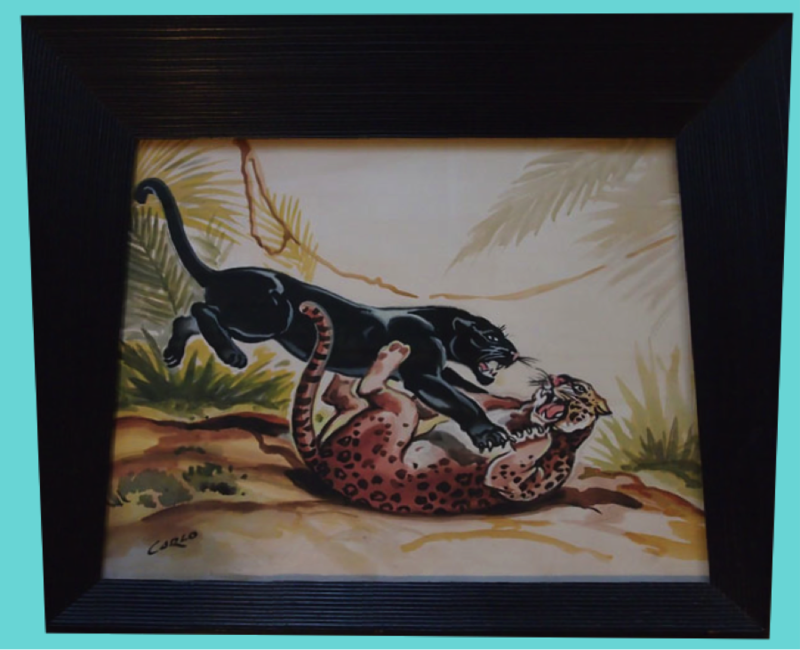 Posted in The Makin's Of Our Pad and tagged 1950's, 1960's, 50's, 60's, Atomic, Carlo Hollywood, Carlo of Hollywood, Carlo water color, chalkware, hawaiian, MCM, mid century, mid century tiki, midcentury, retro, retro decor, retro tiki, tiki, Tiki bar, tiki culture, tiki god, Tiki Room, tropical, vintage, vintage lamp, vintage tiki. Bookmark the permalink. Mel and I came across this framed piece today at a local antique store. I had been eyeballing it for some time. I am not sure of its age but it almost has a whimsical Disney feel to it. Each face is so annimated and colorful! Unfortunately, I can not decifer the artists name! Anybody familiar with this artist? 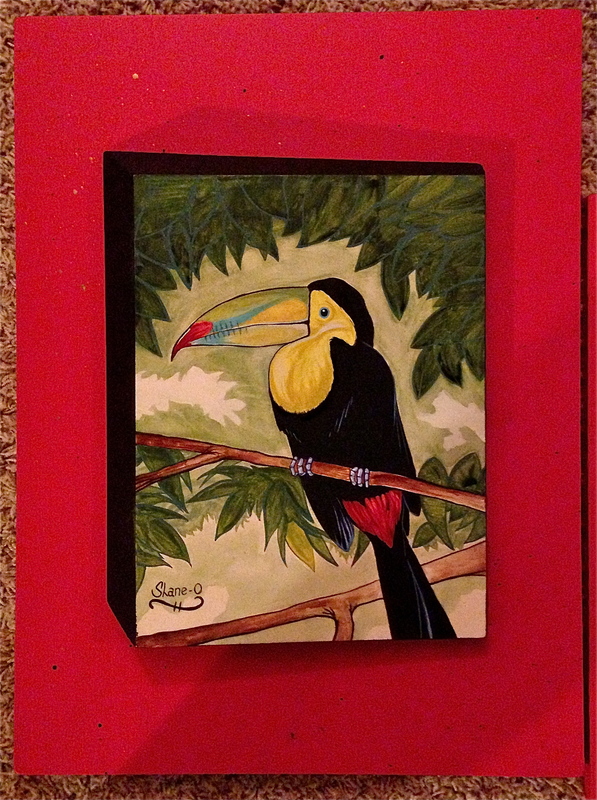 I think this will be a cool addition to our tiki room! 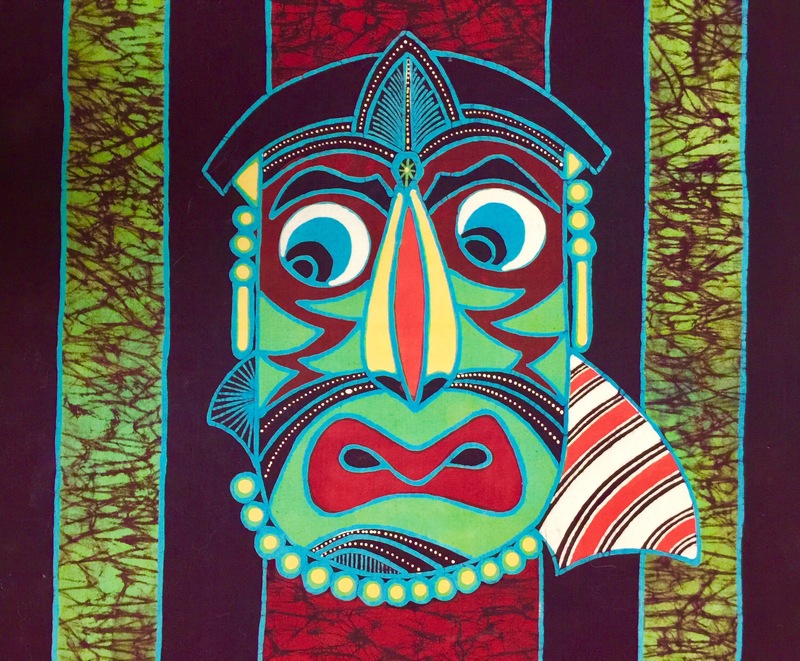 Posted in The Makin's Of Our Pad and tagged funky tiki, hawiian, mid century tiki, tiki, tiki fabric, tiki fabric art, tiki god, tiki mug, tropical, vintage tiki. Bookmark the permalink. Mel and I picked this set up recently. 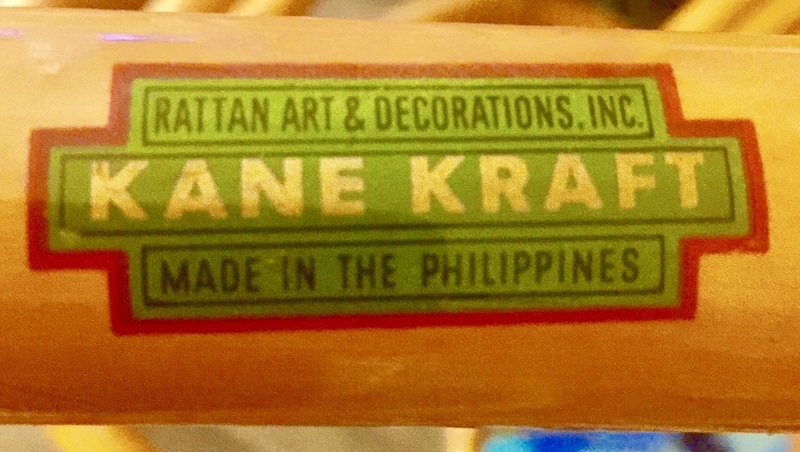 Paul T. Frankl designed this set for Kane Kraft sometime in the late 40’s or early 50’s. 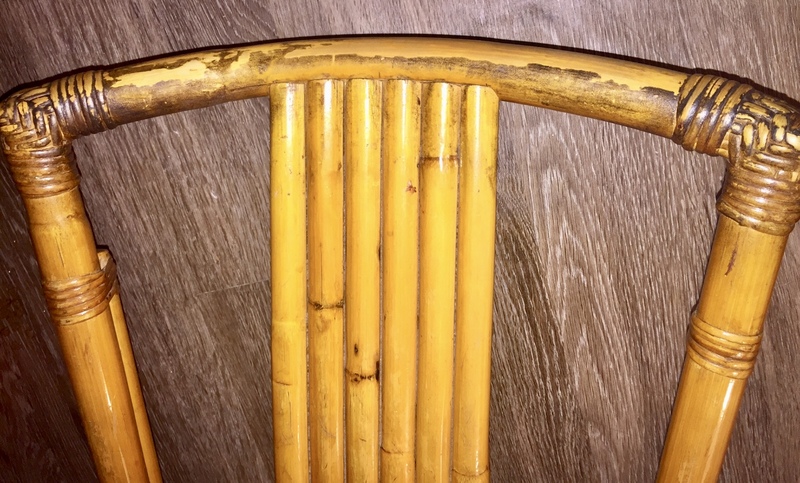 I have always wanted a vintage bamboo dining set and this was the exact style I had in mind. As you can see, the set was a little grubby from years of use. Most of the filth came off with cleaner, but the backs of the chairs had years of oil and grease built up on the surfaces. I cleaned them and resprayed them with polyurethane. I have yet to clean this piece but that is all it should need. We purchased this with plans to pick it up the following week. 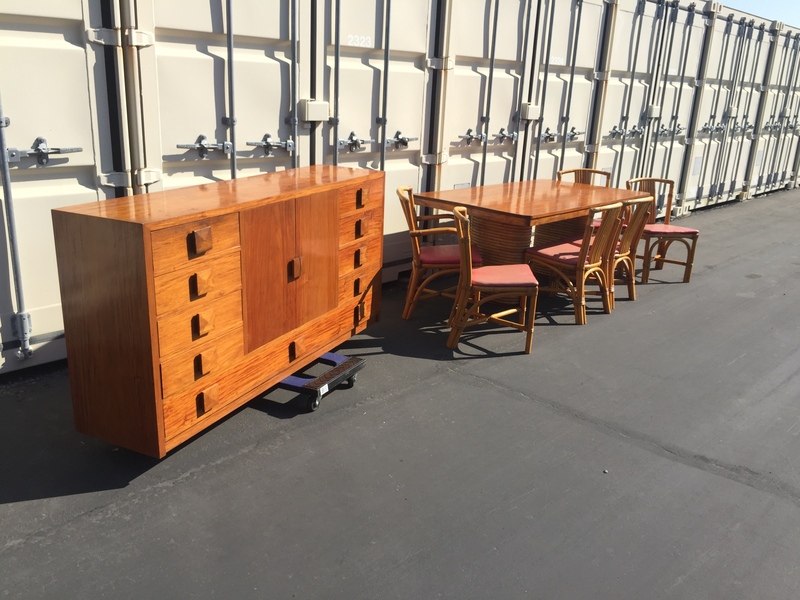 When we returned the store owner brought to our attention that there was a matching sideboard if we were interested! Yes please! The top of this piece is fantastic! So much storage, and we love those knobs. The wood used appears to be solid Koa or Narra. 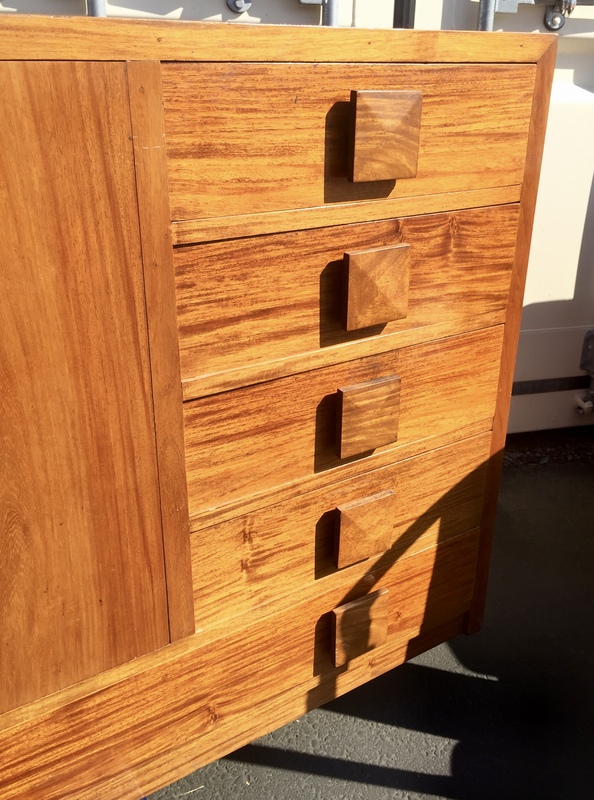 The sideboard is solid and heavy. 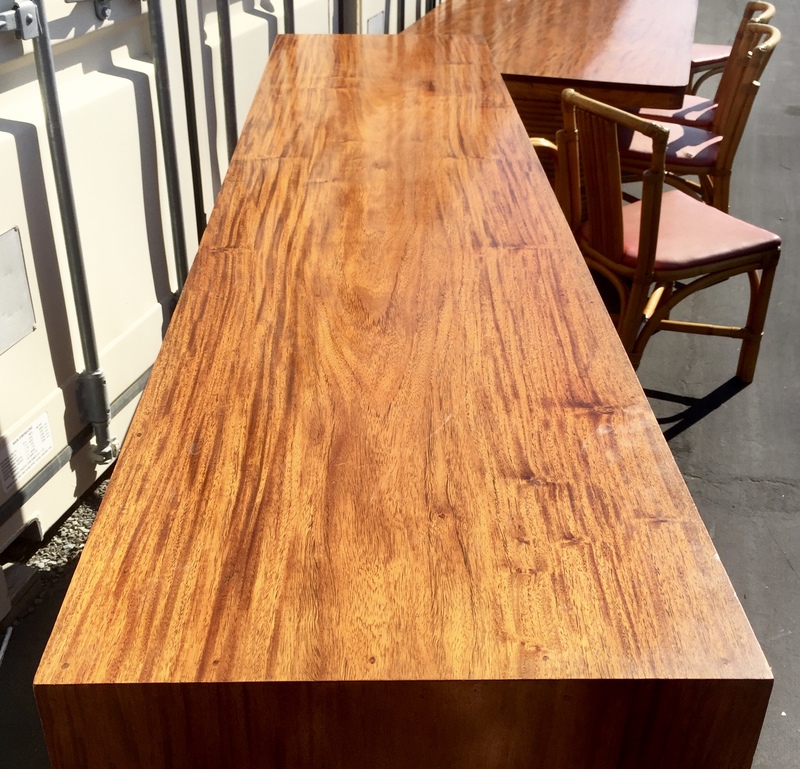 The grain of the wood glows like beams of sunlight in the sun. I am currently on the hunt for appropriate fabric to recover the seats in. 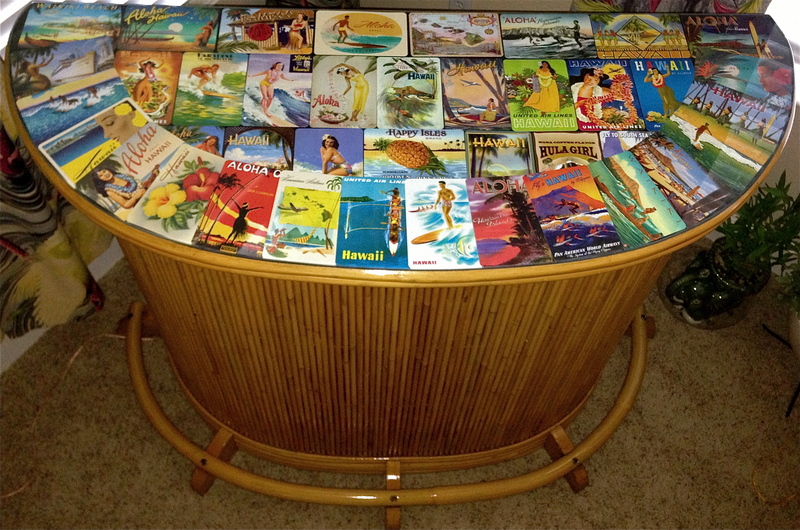 Posted in Restorations, The Makin's Of Our Pad and tagged 1940's tiki, 1950's tiki, 40's tiki, 50's tiki, 6 band, Art Deco, art deco tiki, Atomic, atomic tiki, hawaiian, MCM, mid century tiki, midcentury tiki, pretzel, Rattan, retro tiki, tiki, tiki god, tropical, vintage, vintage tiki. Bookmark the permalink. These are some really cool Erich pieces. 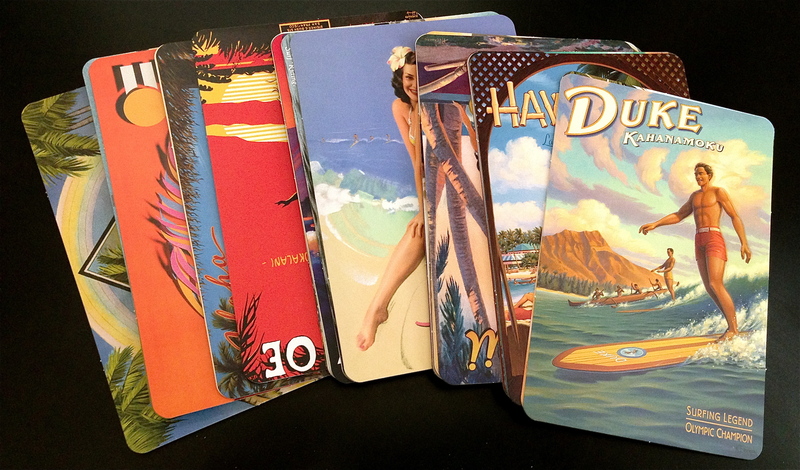 These are such cool tropical images. The kicker is that they are in Carlo style frames. After we finished stocking our booth at Midway we decided to do a little shopping and found a few items. 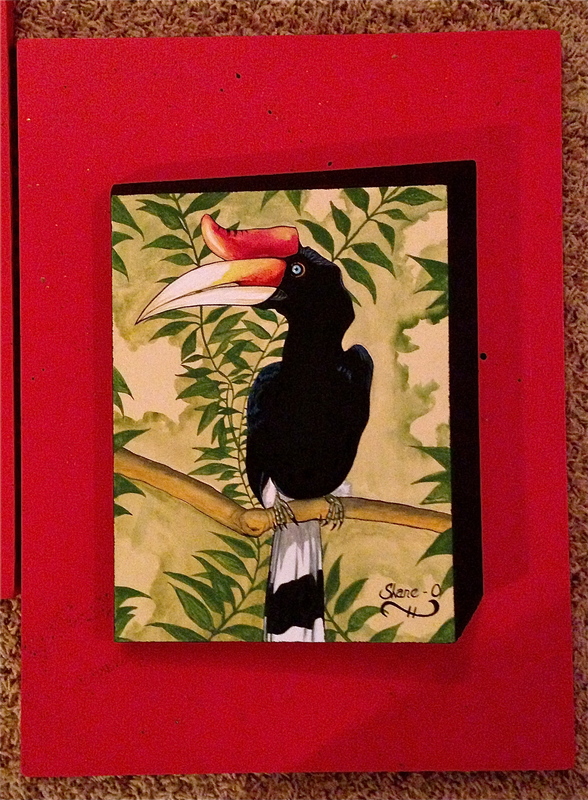 The first items are a couple of Erich art pieces. We have one Asian Erich piece hanging in our bedroom. I have not seen many pieces by Erich and there isn’t any info on the artist either. These look like a day in the life of Polynesians. 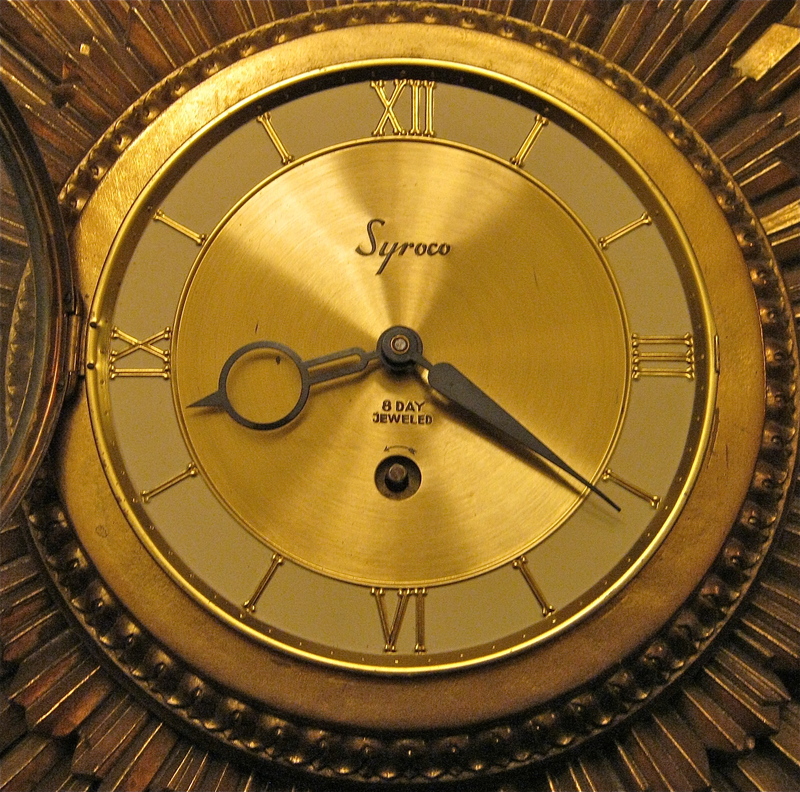 The next thing we came across was this really cool Syroco Clock. We have 2 or 3 of these already. 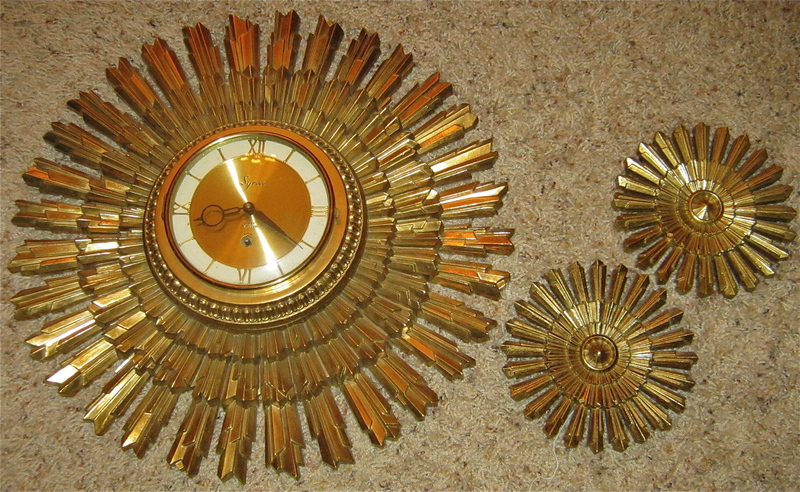 The things that caught our eye were the two starburst accessories to this clock. We never see a complete set for these clocks. These are soo COOL! This clock didn’t come with a key but you can get these easily. The next thing we found was this really cool vintage floor lamp. I love how simple it is but it still screams cool. We needed more light in the Tiki room & this should do it. 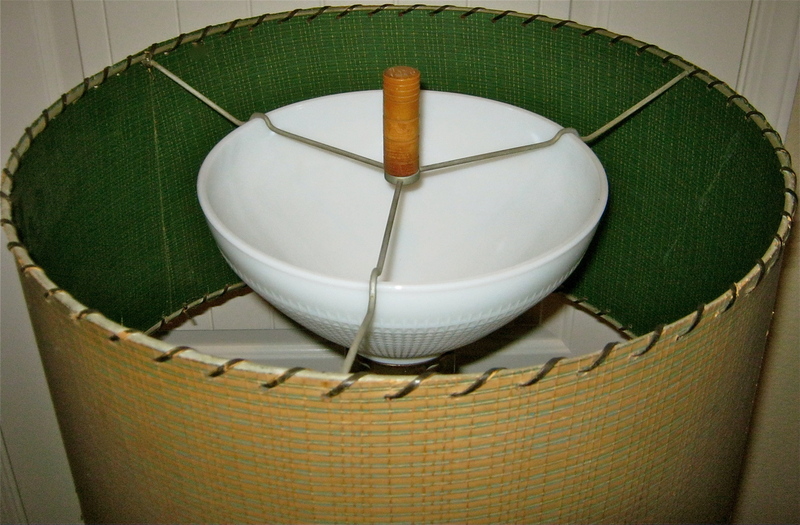 This is a really simple Tiki floor lamp and that is cool with me. I am going to replace the shade with something cooler. This lamp has a huge diffuser and it takes a bulb the size of a lighthouse bulb. These are just some simple things we came across. It has been a while since we went antique shopping and it was nice to get out and do what we really love. Mel and I are fortunate because we both have a passion for antiques. I count myself fortunate to be able to share this passion with my best friend. 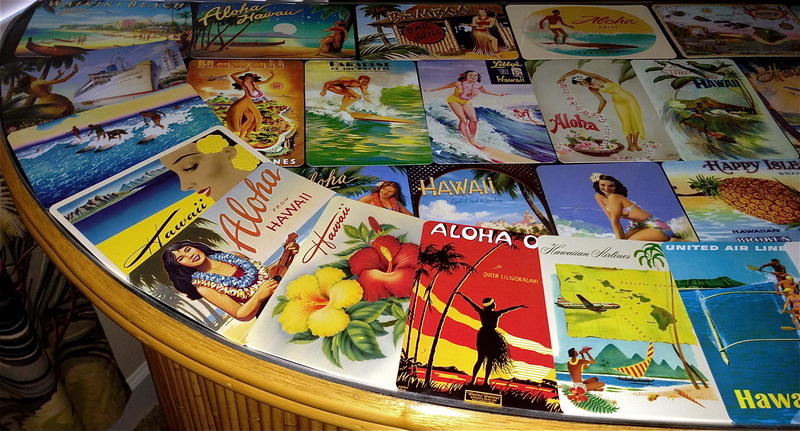 Posted in The Makin's Of Our Pad and tagged Clock, erich, kon tiki, moai, Polynesians, retro, starburst clock, tiki, tropical. Bookmark the permalink. 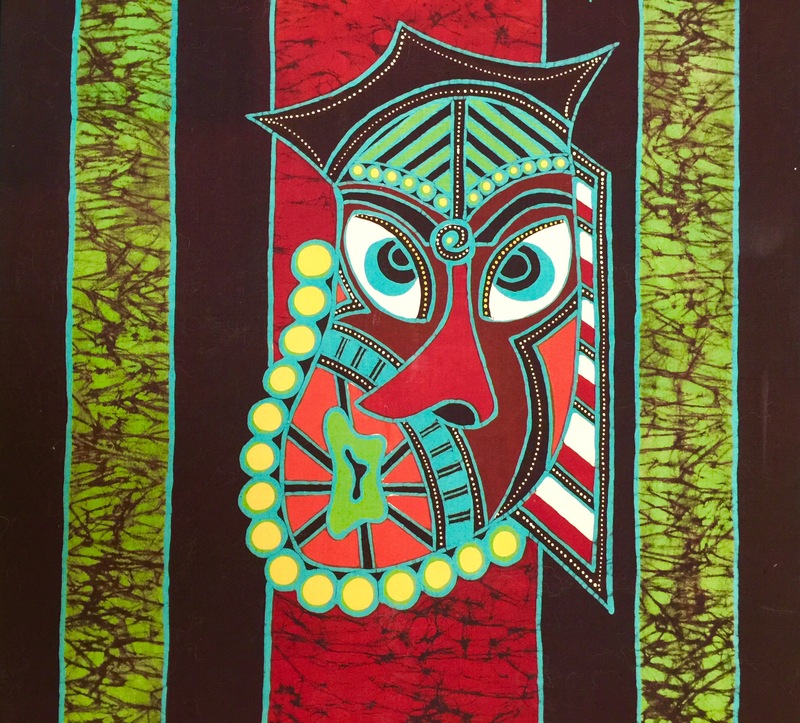 This piece is titled “Bora Bora”. This was the only photo I could find of him. Obviously this was towards the end of his life. 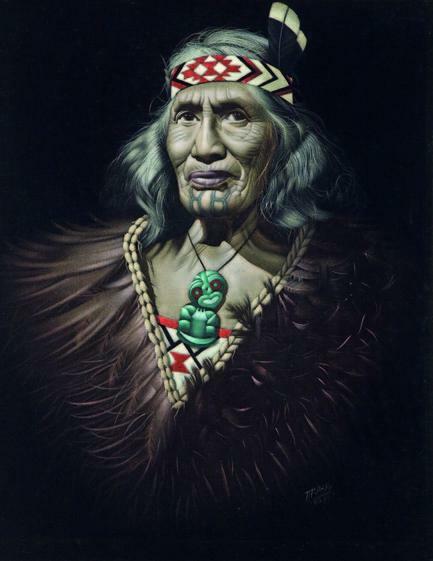 Charles McPhee was born in Australian and went to Western Samoa in 1939 as a muscular young signwriter and mandolin player in search of adventure. There he married a lady named Toila and took a wartime job as a police officer. But he wanted to be a painter. He practiced his painting skills on American servicemen and warships, and the couple named their son, Paul Gauguin McPhee. 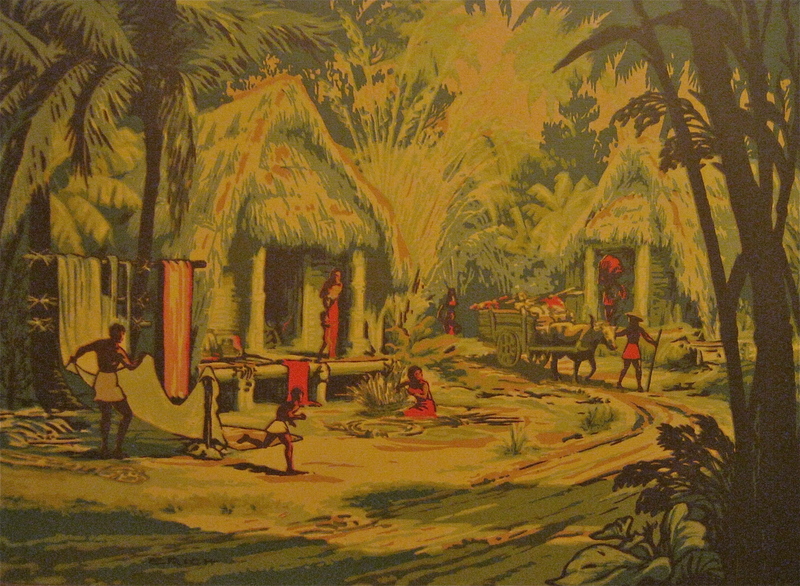 The marriage ended and McPhee moved to Tahiti, where he learned the difficult and painstaking technique of painting in oils on velvet from American expert Edgar Leeteg. He fell for one of his mentor’s models, Elizabeth. 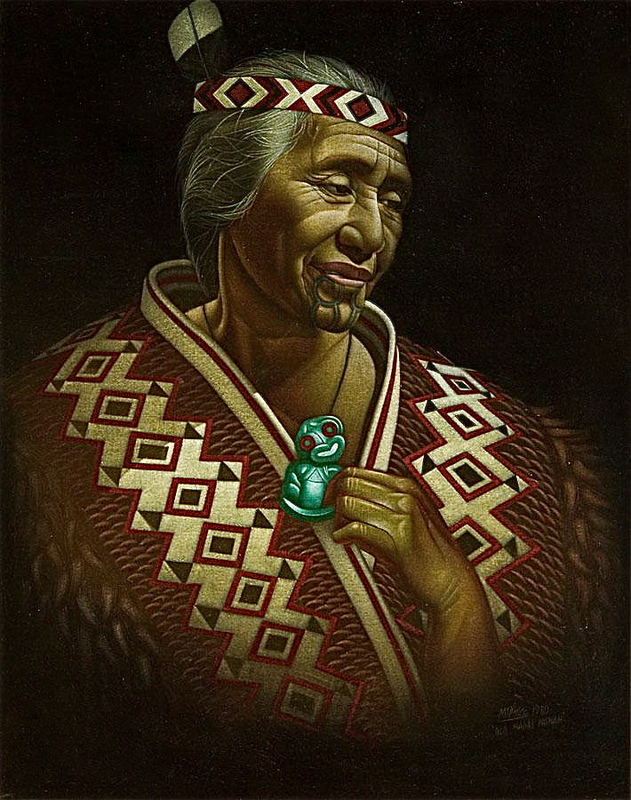 She became his model for a series of Tahitian Girl, which he continued to paint for an eager public after the couple settled in New Zealand in 1951. 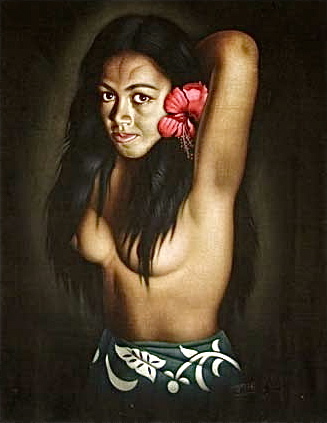 Those who have seen versions of Tahitian Girl over the years find it romantic that the girl in the painting never seemed to age along with the model, Elizabeth. In his eyes, she retained her youthful beauty. His son, Paul McPhee, was unable yesterday to cast light on the mystery. “It’s a hard one. Yes, Elizabeth posed for father on several occasions and, yes, the look of the women stayed the same. 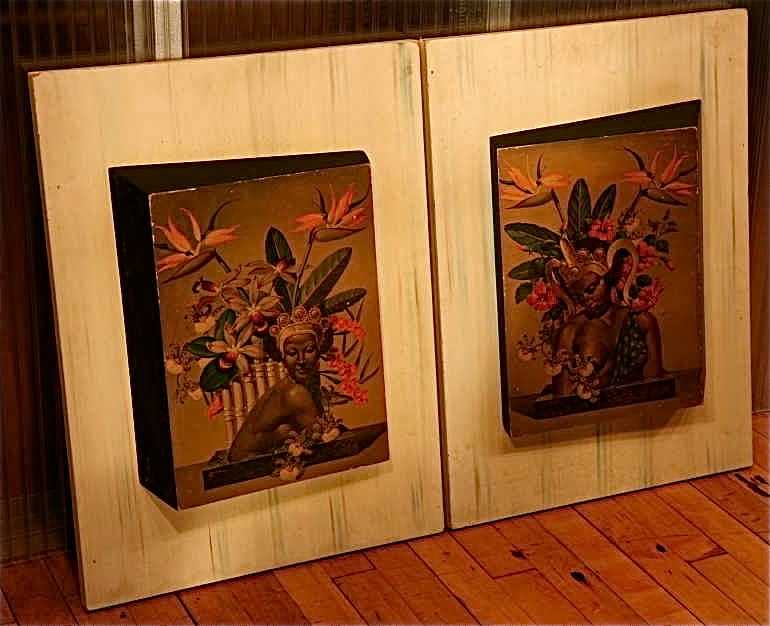 “Elizabeth was beautiful … but we can’t infer he used her as a body for all his paintings.” Paul McPhee said he had a collection of his father’s paintings. “I had to buy them off my father because he never had any … If he kept one it would be sold. 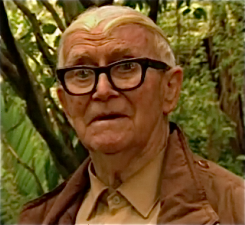 Someone would come to the house and say, ‘I’ll take that one’ and he would sell it to them.” McPhee died in November 2002 at the age of 92. I know but we are all adults here! Anyways, he seems to be able to make his paintings look soo life-like. This one is called “Dusky Maiden”. He was such a prolific artist and produced such cool pieces. 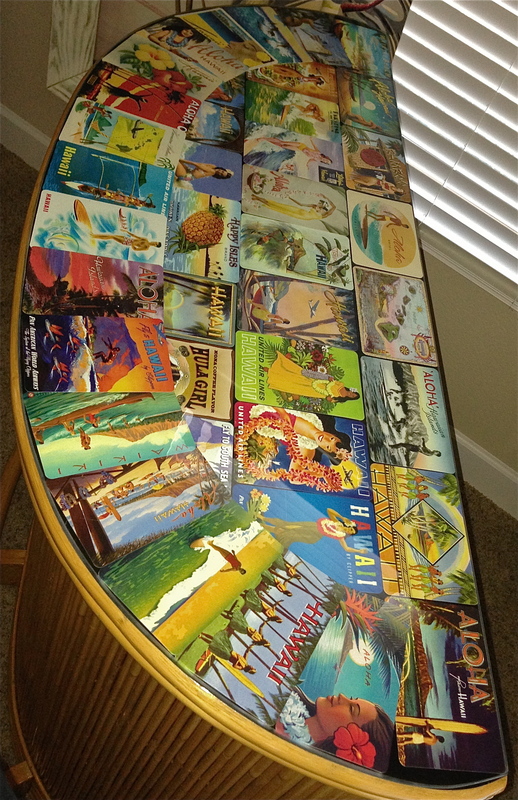 I guess I am really keen on his work because of our efforts in our Tiki Room. 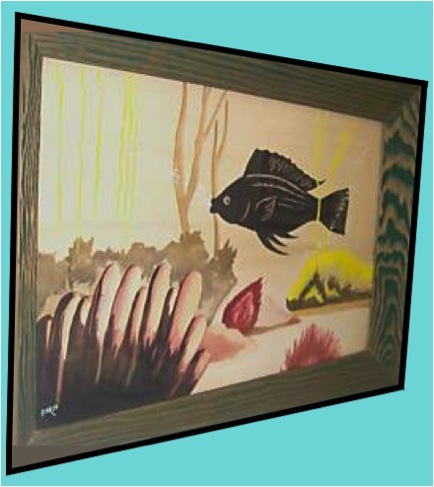 We would love to have one of his pieces in our collection but they are not that common and can be kind of expensive. The black of the velvet really makes the imagery jump off the canvas. It is obvious he was an artist who was a master of his technique, and showed a fine eye for the human form in sensual portrayals of women and athletic warriors. 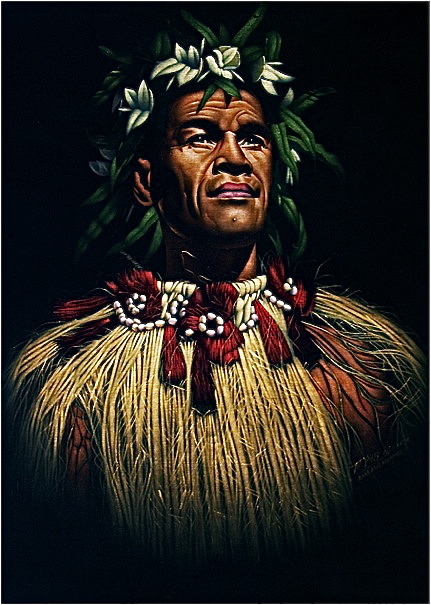 He mostly painted Samoa natives but occasionally painted other things like landscapes and clowns. 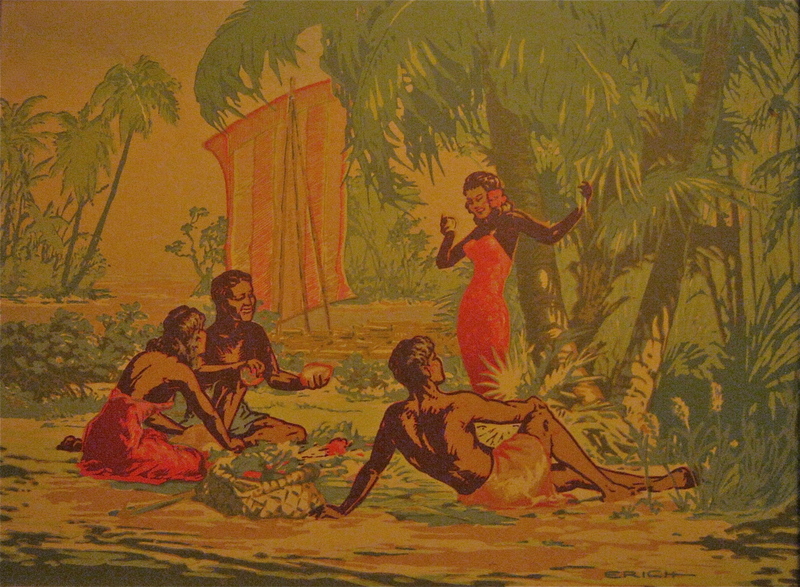 Velvet art was pretty common in a lot of the trendy Tiki restaurants during the 50’s. It was interesting learning about Mr.McPhee and to see a sampling of his work. It would really be something to be able to paint like him. I will look upon the piece I found on-line with a little more interest. 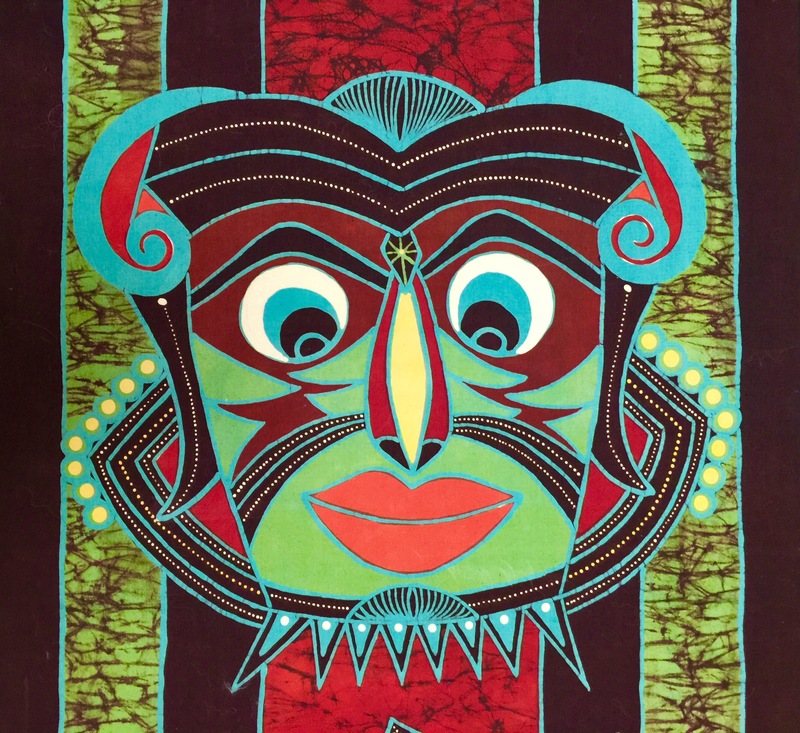 Posted in Nostalgia and tagged hawaii, hawaiian, moai, oil painting, tiki, tiki mask, tropical. Bookmark the permalink. 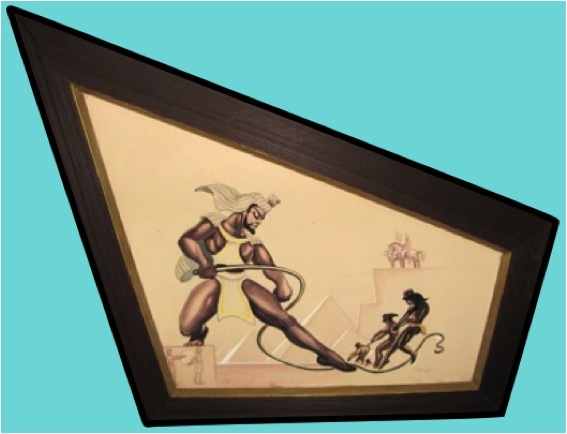 We already own these famous pieces by Cosmo De Salvo in different frames. We love his work! These frames have a cool 3D effect. Mel and I purchased this set of Cosmo De Salvo Artone creations online. Though these look great in the photo they arrived in sad shape. The images were scratched and peeling off in the corners. We were not happy with them and set them aside till we could come up with something else to do with them. Since I am on this painting kick (I can’t STOP!!!) I decided to revamp these pieces into something we could use. 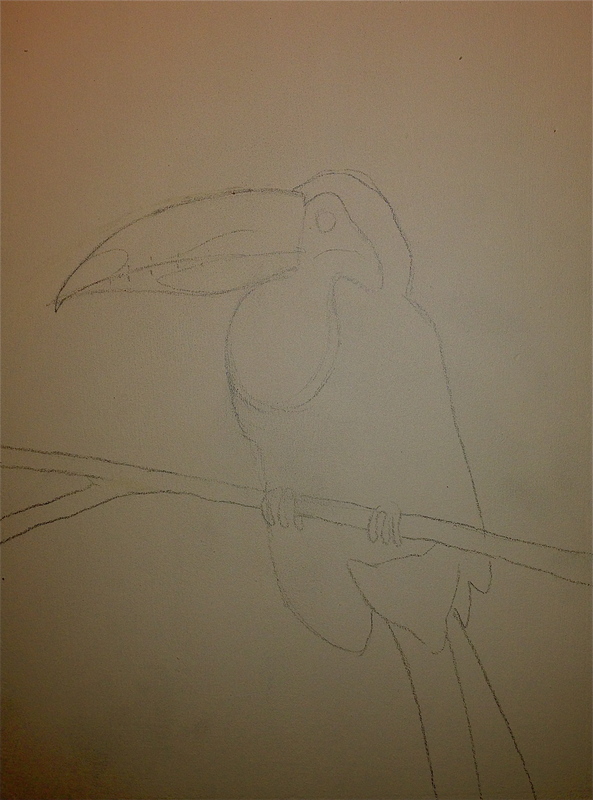 As with all my watercolors you have to sketch out what you plan to paint, Here I sketched out a Tucan. I think this looks great with the frame. I painted the part that pushes the art work out black. The flat portion of the frame I painted red with black and gold speckles. These are strange-looking birds, very exotic. We are very happy with the way these look and cant wait to see them on the wall. 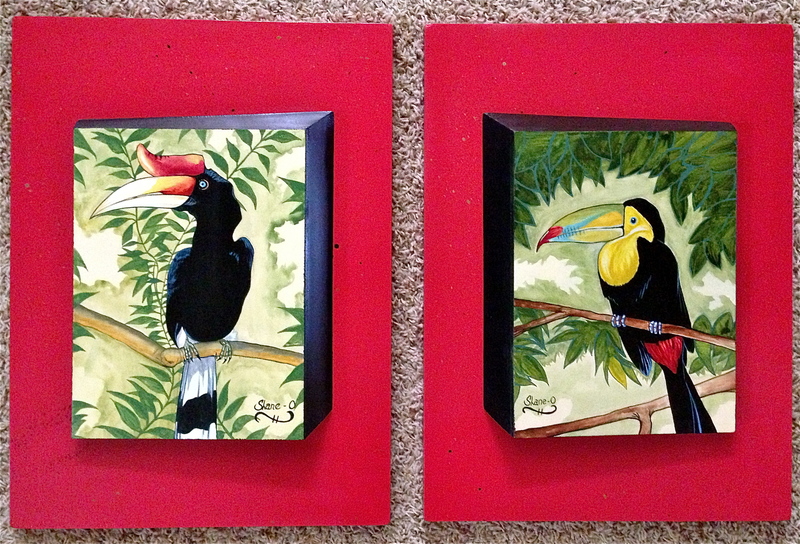 Posted in Restorations and tagged 1950's, hawaii, retro, Rhinoceros Hornbill, tiki, tropical, vintage. Bookmark the permalink. 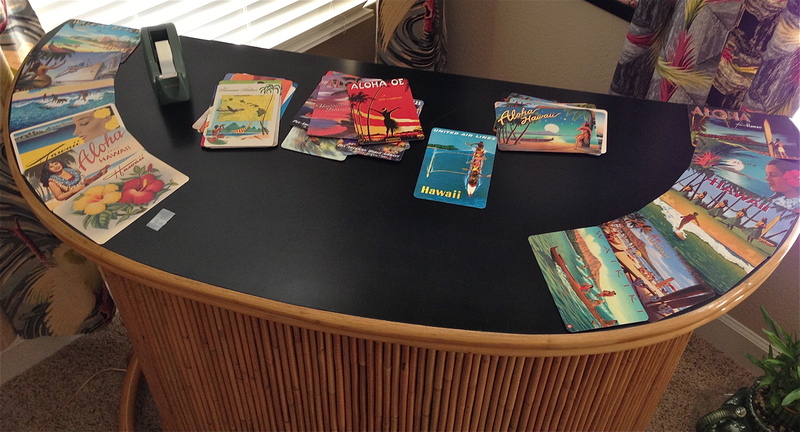 The are reproductions of original postcards from Hawaii. I These have a matte finish so they will not fuse to the glass. I could have used originals but I taped the back of these cards to the top of the bar and that may ruin them. Here is a simple way to “Retro” something up. You can do this to any furniture that has protective glass on top of it. 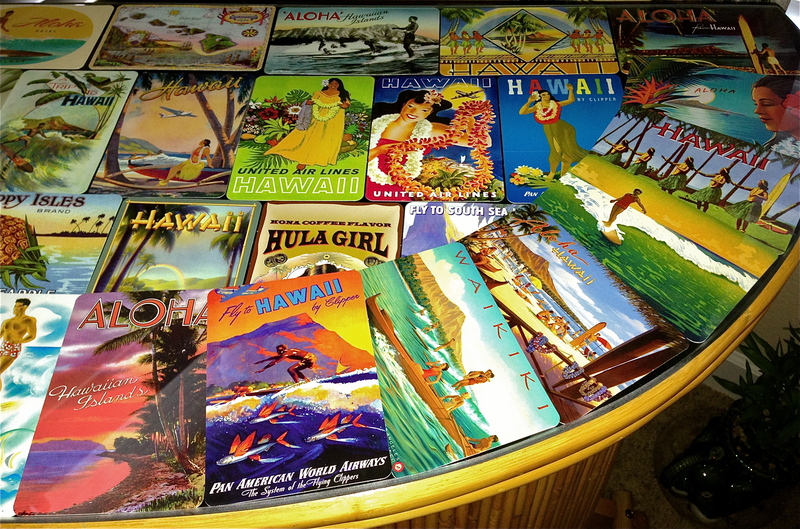 You can do this with family pictures, postcards, fabric or any kind of memorabilia. The only thing I can warn you about is if the finish on the pictures you are putting under the glass is glossy it may fuse to the glass ruining your pictures. If they are glossy then you will have to place those clear rubber bumpers under the glass to keep air between the two surfaces. With this process you need to make a dry run and see how you want to lay out the cards before you tape them down. I tried it a couple of different ways to find what looked best. I love the imagery of these cards. They make you want to jump on a plane and fly to far off tropical places. Mel and I think this simple little trick is great! If you have a beat up surface or a surface you do not care for then this should help. The glass was about $60 bucks and the postcards were about $35. It would have taken a lot more effort to re-Formica this and I honestly we do not think it would have looked better than it does now. The only thing we are waiting on now are the cushions. They are over at B&T upholstery. I expect we will have them sometime next week. We can not wait to see this bar finished. 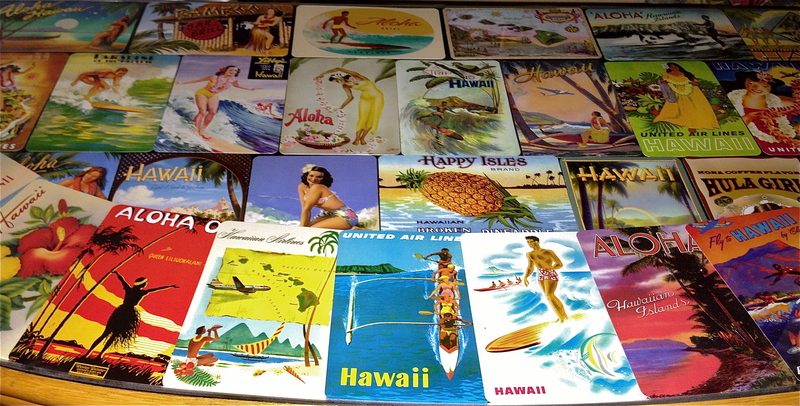 Posted in Restorations and tagged Arts, bar, Crafts, hawaii, retro, tiki, Tiki Room, travel, tropical, vintage. Bookmark the permalink.